THE CONTENT OF THIS WEBSITE/BOOK/E-BOOK/CD-ROM/DVD/VIDEO RECORDING/AUDIO RECORDING IS NOT INTENDED TO BE A SUBSTITUTE FOR PROFESSIONAL MEDICAL OR BEHAVIORAL ADVICE, DIAGNOSIS, OR TREATMENT. ALWAYS SEEK THE ADVICE OF YOUR VETERINARIAN OR OTHER QUALIFIED ANIMAL HEALTHCARE PROVIDER WITH ANY QUESTIONS YOU MAY HAVE REGARDING A MEDICAL OR BEHAVIORAL CONDITION THAT YOUR PET MAY SUFFER FROM. All Content provided on or through this book / e-book / website / DVD / video / audio recording / CD-ROM (i) is provided for informational purposes only, (ii) is not a substitute for professional veterinary advice, care, diagnosis or treatment, and (iii) is not designed to promote or endorse any veterinary practice, program or agenda or any medical tests, products or procedures. The book / e-book / website / DVD / video / audio recording / CD-ROM does not contain information about all diseases, nor does this book / e-book / website / DVD / video / audio recording / CD-ROM contain all information that may be relevant to a particular medical or health condition. You should not use any Content for diagnosing or treating a medical or health condition. If your pet has or suspect that your pet has a medical problem, you should contact your professional veterinary provider through appropriate means. You agree that you will not under any circumstances disregard any professional medical advice or delay in seeking such advice in reliance on any Content provided on or through the book / e-book / website / DVD / video / audio recording / CD-ROM. Reliance on any such Content is solely at your own risk. Content provided on or through this book / e-book / website / DVD / video / audio recording / CD-ROM regarding herbal treatments, home diets, dietary supplements, acupressure, human over the counter products, aromatherapy, homeopathy, and massage have not all been evaluated or approved for use in animals. You agree to consult your veterinarian before beginning any course of treatment. NEVER DISREGARD PROFESSIONAL VETERINARY OR MEDICAL ADVICE OR DELAY IN SEEKING IT BECAUSE OF SOMETHING YOU HAVE READ OR SEEN ON OUR WEBSITES/BOOKS/E-BOOKS/AUDIO CDS/AUDIO RECORDINGS/VIDEOS/DVDS/CDROMS. IF YOU THINK YOU MAY HAVE A MEDICAL EMERGENCY INVOLVING YOUR PET, YOU SHOULD CONTACT YOUR PERSONAL VETERINARIAN, OR AN EMERGENCY PET OR ANIMAL CLINIC IN YOUR AREA. ALTHOUGH VETERINARY SECRETS REVEALED DOES FEATURE INFORMATION AND CONTENT FROM SOME PROFESSIONALS, FOUR PAWS ONLINE LTD. AND VETERINARY SECRETS REVEALED DO NOT RECOMMEND OR ENDORSE ANY VETERINARY PROFESSIONALS, NOR ANY TREATMENTS, PRODUCTS, PROCEDURES, OPINIONS, OR OTHER INFORMATION THAT MAY BE MENTIONED ON OUR WEBSITE OR IN OUR BOOKS, E-BOOKS, AUDIO CD’S, VIDEO, DVDS, CD-ROM’S, VIDEOS, AND AUDIO RECORDINGS. RELIANCE ON ANY INFORMATION PROVIDED BY FOUR PAWS ONLINE LTD. AND VETERINARY SECRETS REVEALED OR OUR EMPLOYEES, OTHERS APPEARING ON OUR WEBSITE AT THE INVITATION OF FOUR PAWS ONLINE LTD. AND VETERINARY SECRETS REVEALED, OR OTHER VISITORS, USERS OR MEMBERS IS SOLELY AT YOUR OWN RISK. ANY MATERIAL DOWNLOADED OR OTHERWISE OBTAINED THROUGH OUR WEBSITES IS DONE AT YOUR OWN RISK AND YOU WILL BE SOLELY RESPONSIBLE FOR ANY DAMAGE OR HARM TO YOU, YOUR PETS, YOUR COMPUTER SYSTEM (OR ANY COMPONENT CONNECTED TO YOUR COMPUTER SYSTEM) OR LOSS OF DATA THAT RESULTS FROM USE OR DOWNLOAD (INTENTIONAL OR OTHERWISE) OF ANY SUCH MATERIAL. THIS BOOK AND THE PRODUCTS ARE PROVIDED ON AN “AS IS” AND “AS AVAILABLE” BASIS; FOUR PAWS ONLINE LTD. AND VETERINARY SECRETS REVEALED EXPRESSLY DISCLAIMS ALL WARRANTIES OF ANY KIND, WHETHER EXPRESS OR IMPLIED INCLUDING, WITHOUT LIMITATION, THE IMPLIED WARRANTIES OF MERCHANTABILITY, FITNESS FOR A PARTICULAR PURPOSE AND NON-INFRINGEMENT. WITHOUT LIMITING THE FOREGOING, FOUR PAWS ONLINE LTD. AND VETERINARY SECRETS REVEALED EXPRESSLY DISCLAIMS THE ACCURACY, COMPLETENESS, APPLICABILITY, EFFICACY AND TIMELINESS OF THE CONTENT, MATERIALS AND DATA OF ITS WEBSITES, BOOKS, E-BOOKS, AUDIO CD’S, VIDEOS, DVDS, CD-ROMS, AND AUDIO RECORDINGS. FOUR PAWS ONLINE LTD. AND VETERINARY SECRETS REVEALED DOES NOT REPRESENT OR WARRANT THAT (I) THE BOOKS, WEBSITES, VIDEOS, DVDS, AUDIO RECORDINGS, CD-ROMS OR OTHER PRODUCTS WILL MEET YOUR EXPECTATIONS OR REQUIREMENTS, (II) THE SITE OR PRODUCTS WILL BE UNINTERRUPTED, TIMELY, SECURE, OR ERROR-FREE, (III) ANY RESULTS OR CONTENT THAT MAY BE OBTAINED FROM THE USE OF THE SITE OR PRODUCTS WILL BE ACCURATE, TIMELY, COMPLETE OR RELIABLE, AND (IV) ANY ERRORS IN ANY PRODUCTS WILL BE CORRECTED. TO THE MAXIMUM EXTENT PERMITTED BY LAW, FOUR PAWS ONLINE LTD. AND VETERINARY SECRETS REVEALED WILL NOT BE LIABLE UNDER ANY CONTRACT, NEGLIGENCE, STRICT LIABILITY OR OTHER LEGAL OR EQUITABLE THEORY FOR (I) ANY SPECIAL, INCIDENTAL, INDIRECT, CONSEQUENTIAL OR EXEMPLARY DAMAGES ARISING OUT OF OR IN CONNECTION WITH THE SITE OR PRODUCTS, EVEN IF FOUR PAWS ONLINE LTD. AND VETERINARY SECRETS REVEALED HAS BEEN ADVISED OF SUCH DAMAGES OR THE POSSIBILITY OF SUCH DAMAGES; (II) THE COST OF PROCURING SUBSTITUTE GOODS, SERVICES, OR TECHNOLOGY; (III) PERSONAL INJURY, INCLUDING, WITHOUT LIMITATION, DEATH, CAUSED BY YOUR USE OR MISUSE OF THE SITE OR THE PRODUCTS; OR (IV) AGGREGATE LIABILITY IN EXCESS OF $100. YOU ACKNOWLEDGE AND UNDERSTAND THAT THE CONTENTS OF VETERINARY SECRETS REVEALED, SUCH AS TEXT, GRAPHICS, IMAGES, INFORMATION OBTAINED FROM FOUR PAWS ONLINE LTD. AND VETERINARY SECRETS REVEALED LICENSORS, AND OTHER MATERIAL CONTAINED ON OUR WEBSITES/BOOKS/E-BOOKS/AUDIO CDS/AUDIO RECORDINGS/VIDEOS/DVDS/CD-ROMS ARE FOR INFORMATIONAL PURPOSES ONLY. You acknowledge and understand that the contents of Veterinary Secrets Revealed, such as text, graphics, images, information obtained from Four Paws Online Ltd. and Veterinary Secrets Revealed licensors, and other material contained on our websites/books/e-books/audio cd’s/audio recordings/video/dvd/cd-roms are for informational purposes only. The content of our website is not intended to be a substitute for professional medical or behavioral advice, diagnosis, or treatment. Always seek the advice of your veterinarian or other qualified animal healthcare provider with any questions you may have regarding a medical or behavioral condition that your pet may suffer from. Never disregard professional veterinary or medical advice or delay in seeking it because of something you have read or seen on our websites/books/e-books/audio cds/audio recordings/videos/dvds/cd-roms. If you think you may have a medical emergency involving your pet, you should contact your personal veterinarian, or an emergency pet or animal clinic in your area. Although Veterinary Secrets Revealed does feature information and content from some professionals, Veterinary Secrets Revealed does not recommend or endorse any veterinary professionals, nor any treatments, products, procedures, opinions, or other information that may be mentioned on our website or in our book, audio cd’s, video, cd-rom or dvd. Reliance on any information provided by Four Paws Online Ltd. and Veterinary Secrets Revealed, our employees, others appearing on our website at the invitation of Four Paws Online Ltd. and Veterinary Secrets Revealed, or other visitors, Users or Members is solely at your own risk. You agree that any information you provide about yourself is accurate and complete information at the time provided. In particular, you represent that you are either: 13 years of age or older; or acting under the direct guidance and supervision of a parent or legal guardian. In addition, you agree to update any information provided to Four Paws Online Ltd. and Veterinary Secrets Revealed to keep it accurate and complete. If you become a Member of “Dr. Andrew Jones’ Inner Circle” membership site and Veterinary Secrets Revealed , your failure to accurately and completely provide, and timely update, information about yourself is reasonable grounds for Four Paws Online Ltd., “Dr. Andrew Jones’ Inner Circle” membership site and Veterinary Secrets Revealed to suspend or terminate your membership and refuse you service in the future. We are committed to protecting the privacy of children. You should be aware that our website is not intended or designed to attract children under the age of 13. We do not collect personally identifiable information from any person we actually know is a child under the age of 13. Certain names, logos, and/or phrases on our site are trademarks of Four Paws Online Ltd. and Veterinary Secrets Revealed or its advertisers and partners. In particular, the marks Four Paws Online Ltd, Veterinary Secrets Revealed, The Online Vet, The Four Paws Online Ltd and Veterinary Secrets Revealed logos, as well as the trade dress associated with Four Paws Online and Veterinary Secrets Revealed are the sole property of Four Paws Online, Ltd.. Users may make no use of our trademarks without our express written consent. In addition, except as otherwise indicated, this website/book/audio cd/audio recording/video and its entire contents (including, but not limited to, the text, video, information, software, graphics, images, sound, audio recordings and animation) are owned by Four Paws Online Ltd. and Veterinary Secrets Revealed and are protected by domestic and international copyright, trademark, and other intellectual property laws. All copyrightable text and graphics, the selection, arrangement, and presentation of all materials, and the overall design of this website are © 2007 Four Paws Online, Ltd. All rights reserved. Permission is granted to Users to download and print materials from this website for the sole purposes of non-commercial viewing, reading, and retaining for reference. Any other copying, distribution, retransmission, performance, display or modification of information or materials on this website, whether in electronic or other form, without our express prior written permission is strictly prohibited. By posting a message, or any other content, or submitting materials or content to “Dr. Andrew Jones’ Inner Circle” or Veterinary Secrets Revealed or our websites, Users expressly grant to Four Paws Online Ltd. and Veterinary Secrets Revealed a nonexclusive, non-revocable, royalty-free worldwide license to use, publish, reproduce, distribute, display, perform, modify, adapt, translate and create other works based upon such content. You also represent that you have all necessary rights to use, publish, reproduce, distribute, display, perform, modify, adapt, translate and create derivative works based upon any such materials or content you post or upload to our website. Finally, if you send to “Dr. Andrew Jones’ Inner Circle” or Veterinary Secrets Revealed or post any photos, video or graphic content to our website that includes a photo or likeness of you, you agree to release Four Paws Online Ltd. and Veterinary Secrets Revealed from all claims and hereby waive all claims relating to the use and reproduction of your photo, name, image, and likeness in all media and for all purposes. Please do not send to “Dr. Andrew Jones’ Inner Circle” or Veterinary Secrets Revealed or post on any Four Paws Online Ltd. forum anything that constitutes a trade secret, confidential or proprietary information. We are not in a position to accept such information, nor can we agree to obligations of nondisclosure or confidentiality with regard to submitted plans or ideas. You agree that any information or materials that you, or individuals acting on your behalf, provide to Four Paws Online Ltd. and Veterinary Secrets Revealed will not be considered confidential or proprietary. If you believe that your copyrighted material has been posted to “Dr. Andrew Jones’ Inner Circle” or Veterinary Secrets Revealed without permission, please see below (paragraph 9) for our policy regarding its removal. 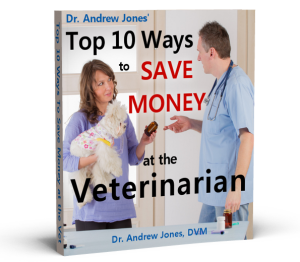 Veterinary Secrets Revealed and “Dr. Andrew Jones’ Inner Circle” includes information and content generated from a wide variety of sources, including veterinarians, trainers, and other professional service providers, as well as, other Users and “Dr. Andrew Jones’ Inner Circle” Members. Users should understand that “Dr. Andrew Jones’ Inner Circle” is a good place to review and share information and thoughts about petcare — but the information is largely informational and represents a limited number of opinions. Four Paws Online Ltd. and “Dr. Andrew Jones’ Inner Circle” cannot guarantee the timeliness, accuracy, efficacy, or veracity of any information provided at “Dr. Andrew Jones’ Inner Circle” , nor the efficiency or applicability of any advice, opinions or content as they may be interpreted and applied to your pet. “Dr. Andrew Jones’ Inner Circle” and Four Paws Online Ltd. are not and will not be responsible for any misleading, false, or otherwise injurious information and advice communicated on our website, or for any results obtained from the use of such information or advice. Four Paws Online Ltd. and all related websites will not be liable for any loss or damage suffered by a User through the User’s reliance on information, content and advice appearing on our book / e-book / website / DVD / video / audio recording / CD-ROM. “Dr. Andrew Jones’ Inner Circle” and Veterinary Secrets Revealed is concerned about the enjoyment, safety and privacy of all its Users, including children that may be using the website under parental supervision. Please remember that the Veterinary Secrets Revealed website/book/audio cds/audio recording/video/dvd/cd-roms are designed to inform, educate, entertain, and support pet owners and pet lovers everywhere, and as a result our product has a diverse audience. Accordingly, it is the responsibility of Users to be respectful of the thoughts, opinions and postings of other Users. In addition, we ask parents and legal guardians of our younger pet owners to monitor the online activities of their children and to determine whether any parts of our site are inappropriate for your child. use any vulgar, obscene, pornographic, seditious, insulting, demeaning, or racially charged or tinged, or otherwise objectionable language. engage in any libelous, defamatory, harassing, slanderous or intimidating, speech, behavior or posting. impersonate any person, including, but not limited to, other Users, or employees of “Dr. Andrew Jones’ Inner Circle”. post, distribute, transmit, or promote infringing or illegal content, including content that is the property of any third party. take any action or post any materials that are harmful to minors or pets. manipulate or forge identifiers in order to disguise the origin of any information or content posted on “Dr. Andrew Jones’ Inner Circle”. post, provide, transmit, distribute or otherwise making available any information (such as inside, proprietary or confidential information) that you do not have a right to make available due to contract, fiduciary duty, or operation of law. post, provide, transmit, distribute or otherwise making available any junk mail, spam or unauthorized commercial email. post, provide, transmit, distribute, upload, email, or otherwise transmit any material that contains any malicious computer code (including spyware, adware, worms, Trojan horses, viruses, etc.). post, provide, transmit, distribute or otherwise make available any information which violates regulations promulgated by any state or federal agency, including the Securities and Exchange Commission, or any other securities exchange, such as the New York Stock Exchange. collect, store or post any personal data about or of other Users. solicit or promote any other business or commercial enterprise or opportunity on any message board, in any chat room, or in any online or interactive forum on veterinarysecretsrevealed.com, theonlinevet.com and other Four Paws Online forums and similar areas. To the extent that our website contains links to other websites and outside services and resources, we do not control the availability and content of those websites, services or resources, nor do we endorse the products, services or content available at or through such other websites. Viewing other websites or utilizing outside services and resources is done at your own risk. 8. Modifications to Our Services. Four Paws Online Ltd. and “Dr. Andrew Jones’ Inner Circle” and Veterinary Secrets Revealed reserves the right from time to time to make modifications and changes to our website, books, e-books, audio cd’s, audio recordings, videos, dvds, cd-rom’s, services, policies and these Terms and Conditions. These modifications and changes may include, discontinuing, temporarily or permanently, any service offered by, or through “Dr. Andrew Jones’ Inner Circle” and Veterinary Secrets Revealed, including “Members” only services, with or without notice. You agree that Four Paws Online Ltd., “Dr. Andrew Jones’ Inner Circle” and Veterinary Secrets Revealed shall not be liable to you or to any other party for any changes and modifications to our website. You further agree to abide by and be bound by any and all changes to our policies and these Terms and Conditions. Certain names, logos, and/or phrases on our site are trademarks of Four Paws Online Ltd. and Veterinary Secrets Revealed or its advertisers and partners. In particular, the marks Four Paws Online Ltd, Veterinary Secrets Revealed, The Online Vet, Four Paws Online Ltd. and Veterinary Secrets Revealed logo, as well as the trade dress associated with Four Paws Online Ltd. and Veterinary Secrets Revealed are the sole property of Four Paws Online, Ltd.. Users may make no use of our trademarks without our express written consent. In addition, except as otherwise indicated, this website/book/audio recording/audio cd/video/cd-rom/DVD and its entire contents (including, but not limited to, the text, video, information, software, graphics, images, sound, audio recording and animation) are owned by Four Paws Online Ltd. and are protected by domestic and international copyright, trademark, and other intellectual property laws. All copyrightable text and graphics, the selection, arrangement, and presentation of all materials, and the overall design of this website are © 2007 Four Paws Online, Ltd. All rights reserved. Permission is granted to Users to download and print materials from this website for the sole purposes of non-commercial viewing, reading, and retaining for reference. Any other copying, distribution, retransmission, performance, display or modification of information or materials on this website, whether in electronic or other form, without our express prior written permission is strictly prohibited. By posting a message, or any other content, or submitting materials or content to “Dr. Andrew Jones’ Inner Circle” and Veterinary Secrets Revealed or our website, Users expressly grant to Four Paws Online Ltd. and Veterinary Secrets Revealed a nonexclusive, non-revocable, royalty-free worldwide license to use, publish, reproduce, distribute, display, perform, modify, adapt, translate and create other works based upon such content. You also represent that you have all necessary rights to use, publish, reproduce, distribute, display, perform, modify, adapt, translate and create derivative works based upon any such materials or content you post or upload to our website. Finally, if you send to Four Paws Online Ltd. and “Dr. Andrew Jones’ Inner Circle” and Veterinary Secrets Revealed or post any photos, video or graphic content to our website that includes a photo or likeness of you, you agree to release Four Paws Online Ltd. and Veterinary Secrets Revealed from all claims and hereby waive all claims relating to the use and reproduction of your photo, name, image, and likeness in all media and for all purposes. Please do not send to Four Paws Online Ltd., “Dr. Andrew Jones’ Inner Circle” and Veterinary Secrets Revealed or post on any Four Paws Online Ltd. or “Dr. Andrew Jones’ Inner Circle” forum anything that constitutes a trade secret, confidential or proprietary information. We are not in a position to accept such information, nor can we agree to obligations of nondisclosure or confidentiality with regard to submitted plans or ideas. You agree that any information or materials that you, or individuals acting on your behalf, provide to Four Paws Online Ltd., “Dr. Andrew Jones’ Inner Circle” and/or Veterinary Secrets Revealed will not be considered confidential or proprietary. If you believe that your copyrighted material has been posted to Four Paws Online Ltd., “Dr. Andrew Jones’ Inner Circle” and/or Veterinary Secrets Revealed without permission, please see below (paragraph 9) for our policy regarding its removal. We respect the intellectual property of others, and we ask you to do the same. We may, in appropriate circumstances and at our sole discretion, terminate the access of Users or Members who infringe the copyright or other intellectual property rights of others. If you believe that your work has been copied and is accessible at our websites/books/e-books/audio cd’s/audio recordings/videos/dvds/cd-roms in a way that constitutes copyright infringement, or that our website contains links or other references to another online location that contains material or activity that infringes your copyright or other rights, you may notify us by providing our copyright agent the information required by the U.S. Online Copyright Infringement Liability Limitation Act of the U.S. Digital Millennium Copyright Act, 17 U.S.C. §512. Repeat infringers will be terminated. 10. Becoming a “Dr. Andrew Jones’ Inner Circle” Member. “Dr. Andrew Jones’ Inner Circle” at www.theonlinevet.com is happy to offer its Users certain “Members only” benefits, including, by way of example, access to specialized content and forums and Member-uploaded video. In order to become a Member, Users must “register” with our website by filling out the form attached at www.theonlinevet.com, agreeing to our membership terms, and expressly agreeing to be bound by these Terms and Conditions by clicking the “I Agree” button at the end of the registration form. “Dr. Andrew Jones’ Inner Circle” Members are solely responsible for maintaining the security of their Member accounts. Members expressly agree not to allow any third parties to use or access their account and to promptly change their account password and/or username in the event that said password or secure access is compromised in any way. 11. “Dr. Andrew Jones’ Inner Circle” and Four Paws Online Ltd. Right To Terminate.